The common name Douglas-fir honours David Douglas, the Scottish botanist who first introduced the tree into cultivation in 1826. Douglas is known for introducing many North American native conifers to Europe. The hyphen in the common name indicates that douglas-firs are not true firs, i.e. they are not members of the genus Abies. 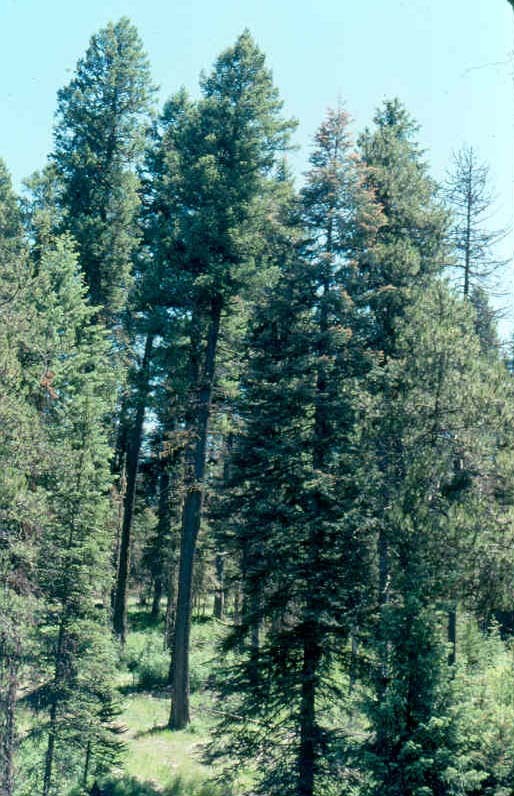 Douglas-firs are medium-size to large or very large evergreen trees, to 20-100m tall. The largest trees grow on the west coast, near Vancouver British Columbia, Canada. The leaves are flat and needle-like, generally resembling those of the firs. 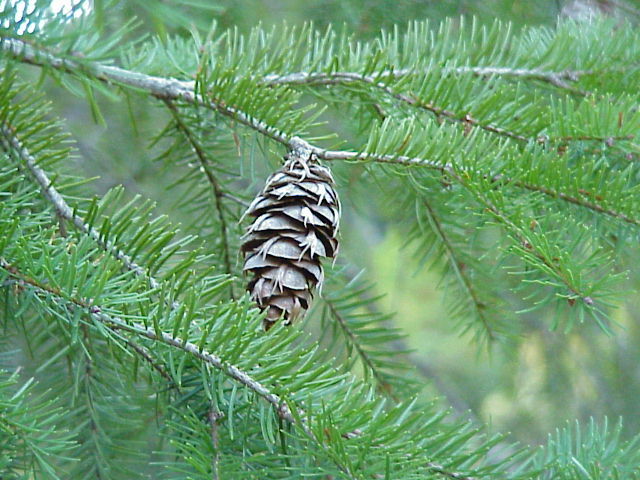 The female cones are pendulous, with persistent scales (unlike true firs), and are distinct in having a long tridentine (three-pointed) bract that protrudes prominently above each scale. A California Native American myth explains that each of the three-ended bracts are the tail and two tiny legs of the mice who hid inside the scales of the tree's cones, which was kind enough to be the enduring sanctuary for them during forest fires. By far the best-known is the very widespread and abundant North American species Pseudotsuga menziesii, a taxonomically complex species (Li & Adams, 1989) divided into two major subspecies (treated as distinct species by some botanists); Coastal Douglas-fir or 'Green Douglas-fir', on the Pacific West coast; and Rocky Mountain Douglas-fir or 'Interior Douglas-fir', in the interior west of the continent. The latter is in turn divided into two varieties, 'Blue Douglas-fir' or 'Colorado Douglas-fir' (var. glauca) in the southern Rocky Mountains, and 'Gray Douglas-fir' or 'Fraser River Douglas-fir' (var. caesia) in the northern Rocky Mountains. The species as a whole is generally known as simply 'Douglas-fir', or as 'Common Douglas-fir'; other less widely used names include 'Oregon Douglas-fir', 'Douglas Tree', and 'Oregon Pine'. It can attain heights of 100 m on the Vancouver West Coast, second only to the Coast Redwood, and is the state tree of Oregon. The specific name, menziesii, is after Archibald Menzies, a Scottish physician and naturalist who first discovered the tree on Vancouver Island in 1791. Away from its native area, it is also extensively used in forestry as a plantation tree for timber in Europe, New Zealand, southern South America and elsewhere; it is also naturalised in the British Isles, Chile and New Zealand. Douglas Fir Resort & Chalets is an alpine resort offering family accommodations in Banff National Park, Alberta. Boston based underground pop band The Douglas Fir.